Hello crafty and cardmaking friends! Meg here, with a quick and simple, yet gorgeous, handmade card using the Time To Blossom clear stamp set from Kennedy Grace Creations. I took the amazing floral stamp from this set and stamped it using VersaFine Onyx Black ink onto a Canson XL watercolor panel. I also stamped the sentiment, and heat embossed everything using Hero Arts clear embossing powder. Before coloring the flower, I took a Spectrum Noir sparkle pen in the color Sea Breeze and outlined the entire flower. I then blended out this very shimmery light blue color with water. The purpose of this was to add a subtle pop to the entire image since this card is very clean and simple. I then colored the flower using Zig Clean Color Real Brush pens. I used the following color for the leaves: 045 Pale Green and 047 May Green. For the flowers: 302 Haze Blue, 303 Shadow Mauve, 803 English Lavendar and 083 Lilac. To finish off the card I added some purple and green sequins from 2 different Kennedy Grace Creations collections; Isabella's Dream and Enchanted Evening. The floral panel was then added to a top folding, Pretty Plum, Spellbinders cardstock card base. 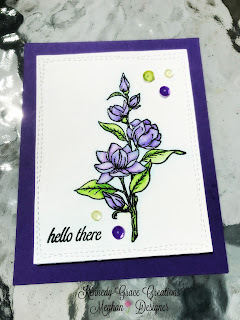 I hope you enjoyed this pretty purple floral card and thank you for visiting my blogpost!